We’d love your help. Let us know what’s wrong with this preview of Warped Galaxies by Cavan Scott. Audio book edition of 'Warped galaxies: Attack of the Necron'. Read by David Tennant. David Tennant is renowned for his theatre and screen work, and his voiceover talents can be heard in dozens of television shows, audiobooks and audio dramas. He’s probably best known as the tenth incarnation of television’s ‘Doctor Who’. On the hive world of Targian, Zelia Lor helps her mo Audio book edition of 'Warped galaxies: Attack of the Necron'. Read by David Tennant. David Tennant is renowned for his theatre and screen work, and his voiceover talents can be heard in dozens of television shows, audiobooks and audio dramas. He’s probably best known as the tenth incarnation of television’s ‘Doctor Who’. To ask other readers questions about Warped Galaxies, please sign up. It's easy to forget that Warhammer 40,000 tends to have a fairly young audience along with its older one. As many voices within the fandom these days range from thirty to seventy-year-old hobbyists, the seven to thirteen demographic that Games Workshop tries to keep itself open can be easily overlooked. In that sense, it's almost a surprise to think that we have not seen something like Warhammer Adventures sooner. The very idea of these stories and their possible direction was discussed some time It's easy to forget that Warhammer 40,000 tends to have a fairly young audience along with its older one. As many voices within the fandom these days range from thirty to seventy-year-old hobbyists, the seven to thirteen demographic that Games Workshop tries to keep itself open can be easily overlooked. In that sense, it's almost a surprise to think that we have not seen something like Warhammer Adventures sooner. The very idea of these stories and their possible direction was discussed some time ago here, which largely weighed concerns against possible execution. The short version was simple: A PG rating on any work will not declaw it of all dark elements, and creative writers can work with that. Thankfully, it's a lesson which seems to have remained true here. Following a chance to listen to this story in full, it looks like things are off to a good start for the Warped Galaxies series. During an era of turmoil within the Imperium, one of its more stable Hive Worlds has found itself under siege from a Necron Dynasty. Attacking without warning or seemingly any reason, the Imperium's armies are quickly forced into a desperate battle, with both the Imperial Guard and Ultramarines quickly forced into a rearguard action. However, the focus is not upon them but a trio of figures trying to escape the violence: The young spacefaring Zelia Lor, assistant to her mother's archeological expeditions, the fledgling hive ganger Talen, and the Martian born Mekki. As the war takes a turn for the worse, they soon find themselves relying upon one another for survival, and uncover a crucial element behind the Necron uprising. As with anything intended to be a gateway into a setting, Attack of the Necron needed to offer the right amount of explaining details to the reader. It needed to both offer up a number of key pointers on how the universe worked but without bogging itself down in exposition or the grander scale elements. While this is something most people expected to be a challenge, Scott manages to accomplish the exact balance needed for such a tale. While the story won't go into detail behind Chaos, the Emperor or how the Imperium works, you learn how it is reliant upon Warp technology, a few of its basic ideological viewpoints, some milder dystopian elements, relationship with technology and even attitude towards aliens. Through simple conversation, thoughts, events, and expressions, the story conveys an immense amount to the listener in an extremely short amount of time. The way in which the story is able to rapidly express so much is largely thanks to the varied viewpoints as much as the characters themselves. While it is true that every story needs its audience surrogate, Attack of the Necron is able to utilise several at once. For example, Talen is able to detail an immense amount about the more dystopian elements within the Imperium and the hive city. At the same time, however, he is completely at odds with space travel and the more advanced technologies the others take for granted. It's not subtle in its execution, but there's rarely a "LOOK AT THIS! SEE! SEE WHAT THIS SAYS ABOUT THE IMPERIUM!!!!" moment as you might expect. This is also without getting into small bits which add life to the setting. Specifically, nuanced moments like a character using the Old Ones in place of the Emperor when appropriate in its mind. The characters themselves are also a nicely rounded bunch, most of who can fall into certain archetypes but never delve into full-on cliches. To offer examples of the other two - Zelia is capable, has great leadership qualities and is forward thinking, but her inexperience in a leading role and desire to always look for the best in others can undermine her. Equally, Mekki is overly calm, distant and tends to empathize with machines over humans, but his social shortcomings are milder than you might expect and he never devolves into the extremes we tend to see from Tech-Priests. While none of them are wholly genre-breaking, each avoids enough pitfalls that it's difficult not to praise it within a Young Adults series. So, what of the story itself? The greatest element working in its favour stems from its narrative pacing, as it keeps throwing new elements and ideas at the reader in quick succession. While Scott typically finds good ways to use a small armory of Chekhov's Guns, he is equally able to keep the story moving at a brisk pace while introducing a multitude of new ideas to the narrative. The book rarely revisits past scenes, and the way it keeps finding new ideas to tap into the story without cheating the reader is quite masterful. You can usually guess what might happen and how at key points, but there are still more than enough curve balls thanks to the setting or environment to keep anyone invested. The pacing itself never undermines the opportunity to have quieter character moments, and this is something which places it head and shoulders above even some adult stories. Attack of the Necron features a full-scale invasion, multiple battles, a car chase and a firefight, but it always pauses long enough to better establish the people involved. It's a human element which helps each of the characters to stay in your mind, along with breaking up the action-heavy setpieces. Without that, so many key moments could have come across as white noise, or been lost entirely due to sheer narrative exhaustion. This would have been an especially great loss, as the story avoids conventional engagements in favour of traps, trickery, and intelligence in the name of survival. The last thing to truly keep in mind about Attack of the Necron's narrative is that it serves as an opening. Much like Corsair: The Face of the Void, this has clearly been written as the start to something greater, so more than a few elements are left unexplained. Unlike that example, however, it still works as a one-off outing, with better closure and a much more coherent three-act arc to events. You can tell the story is going somewhere, but even isolation it still proves to be an engaging and satisfying tale in of itself; the few loose strings are alluded to or relate to mild sequel bait over leaving parts wholly unexplained. Still, as this is a look at the audiobook version, one last part has to be praised: David Tennant. While Tennant's presence might seem like a case of stunt casting, Tennant himself has a broad vocal range and experience with audio work which played to the story's strengths. While Black Library has no shortage of talented actors returning to its productions there are more than a few who tend to have odd limitations or vocal choices. Even my personal favourite, Jonathan Keeble, has fallen victim to this at times with certain characters, which made the likes of Talon of Horus difficult to follow at times. For a new series, it needed a narrator who could get every role absolutely right regardless of age, gender or race, and Tennant knocked it out of the park. After all of this you might think that Attack of the Necron is a perfect work. Sadly, that's not entirely true. With any story set in M42, one fact was always going to be true: In some areas, the story was going to need to pull its punches. It's a Young Adult series, and many of the darker elements are tied so close to the mythology that skipping them would be inevitable. There's no reason to bring up the fact that the Emperor is kept alive only by consuming the souls of a thousand unlucky sods per day, after all. However, even while accepting this, there were various major and minor occurrences which proved irksome. The greatest among these relates to the hive city itself and what we see of the overall underhive. To be blunt, it needed more Judge Dredd. What little we do get downplays so much of the squalor such places are infamous for, that it seems to be almost viable as a living location. Equally, the risks and problems relating to the Imperium's power structure are all but ignored, allowing characters to get away with things that they would otherwise never be permitted to accomplish. In both cases, these might have been easily ignored, were it not for the fact they factor heavily into the background of key characters. The Mechanicus is especially hit hard in this book in regards to its darker elements. On the one hand, Attack of the Necron ditches the more egregious sins of the past few years thanks to this. On the other, it does away with almost anything grim in regard to technology, its limitations or even the anacronysms which define it. The story reaches the point where it seemingly sidesteps key parts of Warp travel and servo-skulls are replaced wholesale with servo-sprites in every situation. Well, that and any mention of the word servitor is replaced with "robot". Yes, the Mechanicum has access to robots still, but the wider Imperium still utilises the mind-wiped cyborgs. Some of these are especially confusing, as the story could get away with using their names but not elaborate on the grimmer details, and get away with it. Even accounting for the liberties taken - because every Warhammer story does them to a degree - characters also seem to understand far more than they should about the wider universe. Space Marines show up and are treated simply super soldiers, rather than divine angels or crusaders as so much of the Imperium seems to think of them as, while the Inquisition is freely mentioned without any of the fear that might usually inspire. None of this is to say that the story completely botches this element - there's an awful lot of xenophobia brought up for one thing - but Scott seemed to pull his punches in the wrong places. Still, focusing on issues with the story over how it fits into the overall universe, we then have the aliens to consider. The Necrons themselves are a major element within the story, and another (perhaps surprising) non-human character ends up sticking with the protagonists throughout the bulk of the story. In each case we see inside their minds and get a feeling for things. There's just one problem - They're too human. In the case of one, we see a few hints of older things, negative regard for the Imperium and a greater awareness of the galaxy. In the other, the Necron in question, we get the impression that they are a dutiful hunter devoted to their task. The problem is that neither offers the impression of originating from a different culture or holding different values, to the point where you could easily think of them as simply being of a different culture. It's an especially notable problem when more than a few opportunities to emphasise the often fragmented mental state of the sentient Necrons is completely passed up, seemingly for the sake of simplicity. Finally, and most notably there is one factor above all which proves to be irksome: A lack of immensity. The writing style present here was certainly aiming for simplicity, and a direct nature which was both easy to follow and comprehend. In that regard, it certainly succeeds, and it helps to make it open to younger readers. However, in doing this, Scott passed up much of what makes Black Library novels often so memorable - The sense of age in the universe, the sheer immensity of events, and the archaic qualities of the cultures present. Attack of the Necron didn't need weapons grade purple prose to execute this, but it would have benefitted significantly from a few vivid descriptions to establish scenes or time to better establish a sense of atmosphere. Without this, the story and setting are interesting, but they do not fully convey what can help to make it so engaging. Ultimately, Attack of the Necron is more Animorphs and it is Redwall. That's not a mark against the story itself (or even either of those series) but it should help to give you a better impression of just what to expect from it. It's an adventure tale with a relatively narrow focus, which succeeds in being a starting point for new readers, but there is a definite emphasis on accessibility. The characters are likable, the story is easily accessible, it's well thought out and fits in well with the better examples of major Young Adult series over the years. Some of its accessibility comes at the cost of details relating to the broader universe in question, and your mileage may vary on how much this ultimately impacts the story. In my personal opinion, it is a detractor but it hardly ruins what is ultimately a very entertaining tale. Given the fact that this premise was fighting an uphill battle in the first place, we could have ended up with something far, far worse than what is ultimately a solid first entry in what should be a great series. 40k fanboys have been horrible about BL books for children existing. They can stuff it. The world of Warped Galaxies is still grimdark, with its hive cities and high body count. A version for kids just doesn't go into the gore, although it does retain the danger. I felt this was more compelling than its Age of Sigmar counterpart, "City of Lifestone" and it has more of a complete story. It ends on one heck of an ominous note, and I'm looking forward to the next installment. I was intrigued by the idea of a Warhammer book for young adults, so when I saw this on offer on NetGalley, I knew I had to read it for review in order to see if it was something I could possibly interest my son in. I found this book to be FTC DISCLAIMER: I RECEIVED AN E-ARC FROM THE PUBLISHER THROUGH NET GALLEY. I VOLUNTARILY OFFER MY HONEST REVIEW OF THE BOOK, THOUGH IT IS NOT EXPECTED OF ME! RECEIPT OF THIS BOOK IN THIS MANNER DOES NOT AFFECT MY OPINION OF THE BOOK OR THE CONTENT OF MY REVIEW! I was intrigued by the idea of a Warhammer book for young adults, so when I saw this on offer on NetGalley, I knew I had to read it for review in order to see if it was something I could possibly interest my son in. I found this book to be a sound introduction to the Warhammer 40,000 universe! By using young adults as the focus for the characterization in the story, it gave readers a sense of a kindred spirit that they could more easily connect with, showing them the universe without all of its more adult appropriate detail. The story was a good adventure, showcasing a female lead that could be used as someone for girls to look up to and aspire to emulate. However, the book used a lot of jargon and concepts that were unique to Warhammer 40K that may intimidate readers not familiar with the universe, even with the included Glossary of Terms at the end of the story. Another issue I had was that I thought that the book might be mislabeled. Parents of sensitive readers should be cautious, as this does showcase a lot of wanton destruction on the part of the Necrons, and I felt it might be a more appropriate read for older young adult readers. By way of outreach and getting the next generation interested (aka 'hooked on plastic crack'), Games Workshop are expanding their fiction offering to include a range targeted at kids aged up to 10. Not a bad plan at all - that was about the age I first started reading White Dwarf, first started falling for the ludicrous gothic baroque of it all, this setting which had seen every other horrifying future and said 'That's not a knife. Well, OK, maybe it is a knife, but this, mate, is a daemon chain By way of outreach and getting the next generation interested (aka 'hooked on plastic crack'), Games Workshop are expanding their fiction offering to include a range targeted at kids aged up to 10. Not a bad plan at all - that was about the age I first started reading White Dwarf, first started falling for the ludicrous gothic baroque of it all, this setting which had seen every other horrifying future and said 'That's not a knife. Well, OK, maybe it is a knife, but this, mate, is a daemon chainsword'. And my generation didn't even live in (as much of) a dystopian SF hellscape! Plus, books for kids have had a real renaissance lately – not that we didn't have some wonderful stuff, but Cat Valente's Fairyland books are for 10-year-olds too, aren't they? And that lushness, that understanding of tyranny and monstrosity, would be ideal for 40K. Even granted that this is not by her, but one of the usual work-for-hire suspects, it could be good. So when I saw this on Netgalley, I thought I might as well give it a go, despite a rather unfortunate cover whose clean lines felt far too Saturday morning cartoon, nowhere near the tattered splendour and lively horridness one sees in the art which renders the setting most intriguingly and evocatively. First page: setting the scene for the newcomers. Excellent; after all, 40K has the best single-line summary of an invented world ever, excerpted from an almost equally awesome one-page version. Except, what's this? 'Life in the 41st millennium is hard...But it is also a place bristling with adventure and wonder, where battles are won and heroes are forged." What happened to the Carrion Lord, the laughter of thirsting gods, the carnage and slaughter? What happened, in the name of all that's unholy, to "In the grim darkness of the far future, there is only war"? 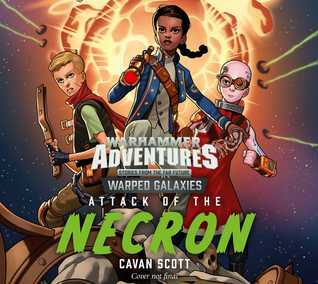 Attack of the Necron is a fun YA adventure set in th Warhammer 40,000 universe. The story feels like a "grimdark" story; lots of people are wiped out when a planet is attacked by Necrons. The characters are entertaining and have to learn to overcome their differences to succeed in their quest. Well worth it for children of hobbyists! Fun story. Definitely written for about middle school kids, so my son liked it alot too and is eagerly anticipating the next volume. Nice to have a girl main character in a book that mostly boys will read. They need to see that. This is a fantastic introductory book for children who have an interest in the Warhammer 40,000 universe. Instead of dealing with Space Marines, as many of the Black Library titles do, our main protagonists are 3 teenagers who find themselves trying to escape a Necrons attack on one of the Imperial Hive Worlds. Attack of the Necron is a planet-hopping tale of action, danger and bravery in the face of an ancient alien menace. Zelia Lor and her mother, along with Lexmechanic Erasmus and young Martian tech-savant Mekki, travel the galaxy excavating ancient technology and unearthing pre-Imperial history. When their latest expedition is curtailed by a devastating alien invasion, Zelia finds herself torn from her familiar life and thrown into a perilous journey through the void of space with the relentless N Attack of the Necron is a planet-hopping tale of action, danger and bravery in the face of an ancient alien menace. Zelia Lor and her mother, along with Lexmechanic Erasmus and young Martian tech-savant Mekki, travel the galaxy excavating ancient technology and unearthing pre-Imperial history. When their latest expedition is curtailed by a devastating alien invasion, Zelia finds herself torn from her familiar life and thrown into a perilous journey through the void of space with the relentless Necron threat looming ever-present. Yes, it’s a children’s book set in the 40k universe, which is about as grim and unpleasant a setting as you can imagine, but it’s handled well, maintaining a sense of 40k’s overall tone and aesthetic whilst focusing on elements which will appeal to younger readers. It’s brilliantly pacy and full of excitement as events quickly move from location to location, and while it works well as a standalone tale, it’s clearly setting the scene and kicking off a wider story (to say more risks spoilers). As an introduction to 40k it’s cleverly constructed and well thought out, as well as being tremendous fun – and yes, 40k CAN be fun. I have not listened to the Audio Version, but I did read an advance copy sent to my library. The book is an excellent introduction to the world of Warhammer 40k, from the great battles between the transhuman Space Marines and the world-killing Necrons, to the struggles of subterranean youth gangs in the sprawling slums of "hive worlds" (think Kowloon Walled City, but less roomy and luxurious). It's a zippy action story with clever protagonists facing overwhelming odds. However, the characterizati I have not listened to the Audio Version, but I did read an advance copy sent to my library. I understand I'm not the target audience for this book, but I rather enjoyed it. It was a fun story with very likeable characters and a whole lot of action. If you have a kid who likes Sci-fi I reckon this would make a good introduction to the warhammer universe. However I don't think it's really a YA story more mid grade. Quite fun. Also, a very good YA take on the WH40k setting, one that should appeal to young readers who are interested in giving it a try. Full review soon. Simple, fun, for kids. 41st millennium still grim. I'm a little outside the recommended age range for this book, but my inner ten-year-old says this was still pretty dull. Instead of taking advantage of the cornucopia of monsters and aliens in the Warhammer 40K universe, it's mostly about kids hitting each other. That's the sort of thing that frustrated me when I was reading books aimed at my age level as a young nerd, and it still bugs me to this day! Aside from a bland `CGI-type battle where a planet is attacked by alien hordes, there is one Ne I'm a little outside the recommended age range for this book, but my inner ten-year-old says this was still pretty dull. Instead of taking advantage of the cornucopia of monsters and aliens in the Warhammer 40K universe, it's mostly about kids hitting each other. That's the sort of thing that frustrated me when I was reading books aimed at my age level as a young nerd, and it still bugs me to this day! Aside from a bland `CGI-type battle where a planet is attacked by alien hordes, there is one Necron in this book. One! There's also a space orangutan for comic relief. Otherwise, it's overloaded with protagonists and some truly pointless ganger drama. Where are the genestealers and the tyranids? The orks and the tau? Where are all the cool-looking things from the Warhammer rulebooks that I'm not old enough to read yet?! ?